Destiny 2's highest level end-game gear, rewarded through the Raid and Factions, may have leaked through the official API for the game. Along with Imperial Engrams, the Annihilating, Channeling and Crushing gear sets appear to be linked to Leviathan raid rewards. 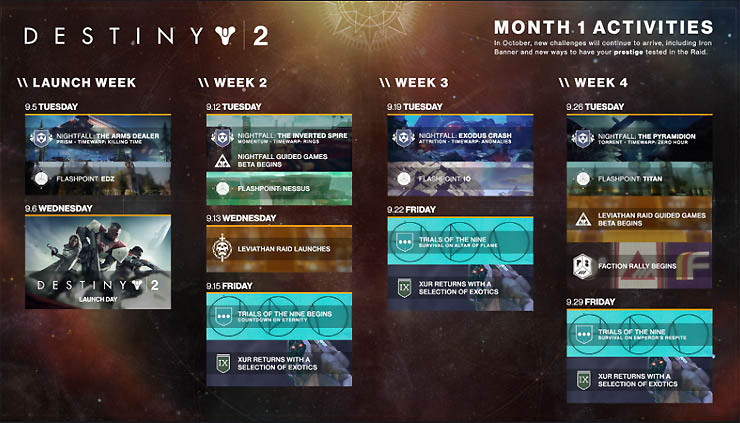 Players should note that the information below was obtained through a leaked source and as such cannot be confirmed until closer to the raids launch date, or when the Destiny API is updated to show Raid and Faction gear. For now, we will treat this leak as legitimate and list some of the gear sets discovered. It's a rather long list and currently there are no images, perks or facts besides the names. Should images and other details appear, I will update the information below or link to a new post with more details on each of the topics. We all knew that factions would be making a comeback in Destiny 2, it was inevitable and has since been confirmed by Bungie. In a recent schedule for the 1st month of Destiny, Bungie confirmed that "Faction Rally" would be an event launching on 26th September. Factions may appear in the game before this date though. For each new faction there are associated engrams, much like the engrams we already know about from vendors such as the Devrim in the EDZ and Banshee the Gunsmith in the Tower. There are also other engrams appearing to prove that high-level activities will have their own engrams. These include Imperial Engrams and Trials Engrams. Imperial Engram - possibly linked to the Raid. Iron Engram - possibly linked to the return of the Iron Banner event. Trials Engram - possible linked to the Trials of Osiris, high level activity. Update: Following the release of both the Leviathan raid and Trials of the Nine, we know that Imperial Engrams are a new faction engram which is rewarded by exchanging "Calus" tokens that are earned through the raid. Just like other faction engrams, these Imperial Engrams result in Legendary gear from the mysterious Sweeper Bot but with a very high Power level. FWC Engram - linked to FWC faction rewards. Dead Orbit Engram - linked to Dead Orbit faction rewards. Gift of the Nine - possible gift from Xur, who may follow a similar pattern to Destiny 1 and offer random exotics. New Monarchy Diamonds - could this be a new currency that only applies to factions? Much like the Bright Dust currency that applies to Tess when buying aesthetic items. The Leviathan raid will of course have it's own Raid armour sets, one for each of the games classes: Titan, Warlock and Hunter. Tradition dictates that the Raid armour is named differently for each class and every item has it's own unique perks, much like exotic armour that is unique to each character class. In Destiny 1, Raid armour matched or even exceeded most of the game's exotic armour. 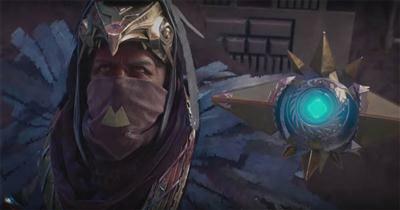 It was also more versatile in use, allowing players to equip an entire Raid set for bonus perks, whereas only one Exotic weapon or armour piece could be used at one time. The same principles are likely to exist in Destiny 2, making Raid gear a very sought after commodity. From the leaked information we can make educated guesses that the following Armour sets may be tied to the Raid. Note, these are not perfect guesses simply because several gear sets are listed in the leak, and there is no way of being certain which of the below is raid related. Also of high importance, the leak included gear sets with a common recurring naming convention, such as Iron Truage or The Interrex. It's likely that these sets all belong to the same faction or activity in the game. A possible Iron Banner year 2 collection of armour covering all of the games classes (Titan, Warlock, Hunter). Each armour piece starts with name "Iron Truage". For example, Iron Truage Helm for the Titan helmet, or Iron Truage Mask for the Hunter. It's unclear which faction this armour set belongs to but it could be part of the high level "Trials", an end-game activity that rivals the Raid for it's precious rewards. Alternatively this could be the Hard Mode rewards from the Leviathan raid. Time will tell if the above information turns out to be true but this is the most extensive end-game leak since launch.